In July of 2017, the New York City Department of Homeless Services (DHS) announced that the city would open a transitional, supportive shelter for families with children at 5731 Broadway (@ W. 236th St.) in the Kingsbridge section of the Bronx. Bronx Community Board 8 held an emergency meeting on July 27 at which officials from DHS and Praxis Housing Initiatives provided information to CB8 members, elected officials, and hundreds of local residents about the planned shelter. Concerned about the outraged and adamant opposition to the shelter by CB8 members, local elected officials, and local residents, many of whom expressed intense NIMBY opposition (“Not In My Back Yard”), and some of whom are declaring attitudes toward homeless people that are racist and discriminatory in nature, BCJN called for a meeting of the ad hoc N. Bronx Racial Justice coalition (which had been inactive since holding a brief series of meetings in late 2016), to mobilize local support for the homeless families and the facility, and to learn more about plans for the shelter through meetings with Praxis and DHS officials. Members of the N. Bronx Racial Justice coalition, of which BCJN, by consensus, is a member, launched a campaign to build community support for the shelter. 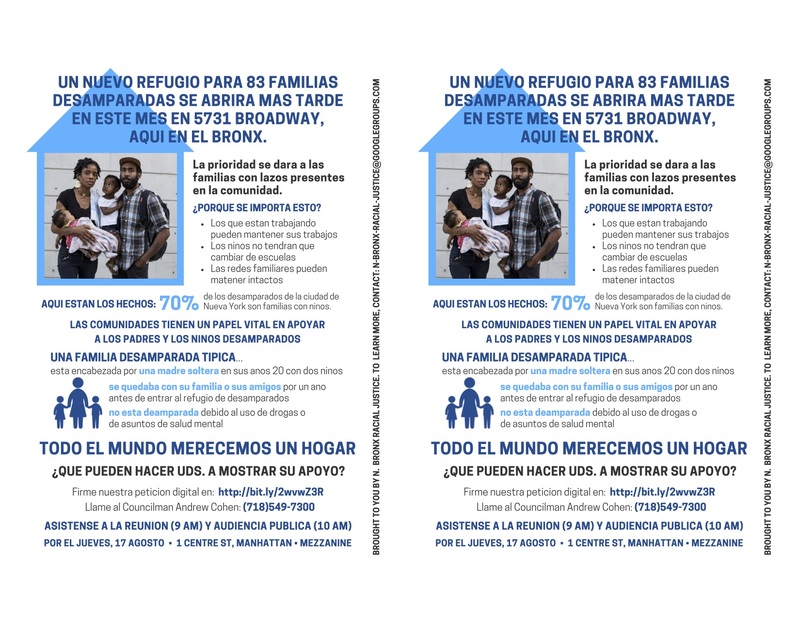 We leafletted at the shelter location and at various subway stops along Broadway (see English and Spanish flyers below); posted a petition to Change.org (as of 8/21/17 there were 235 signers); spoke at the July 27 CB8 meeting in Riverdale; and testified at an August 17 public hearing on the shelter at 1 Centre Street, Manhattan. We are writing to you regarding the supportive, transitional homeless facility for NYC families-with-children that is slated to open at 5731 Broadway in the Kingsbridge section of the Bronx in August 2017. We stand together to welcome and support 83 families who will move into this facility, and future families residing there. We ask that our Bronx elected officials and Bronx CB8 board members join us in welcoming the families to 5731 Broadway. We oppose NIMBY-ism (Not In My Back Yard) and we come together to embrace its opposite — IMBY (In My Back Yard) — for homeless families with children, and other homeless people as part of a restorative, supportive program. We understand that this facility, a first for CB8, reflects the City’s new, borough-based approach to transitional housing for the homeless (as detailed in the City’s plan released in March 2017: “Turning the Tide on Homelessness in New York City”), and will allow homeless people to reside in or near their neighborhood of origin so that they can be supported by their personal networks of friends and family, as well as the local houses of worship, schools, and healthcare services they rely on, rather than being forced to reside far from these networks which are so critical to dignified and functional living for us all. We recognize that CB8 board members and local elected officials have concerns about the process by which 5731 Broadway has been selected to house homeless families, including the lack of transparency and consultation accorded local officials by the NYC Department of Homeless Services, the Stagg Group (the developer), and Praxis Housing Initiatives. We understand local officials’ stated interest in ensuring appropriate and reasonable transparency and consultation, and appreciate their appropriate pursuit of both on behalf of CB8. We know that the homelessness crisis in New York City has escalated in recent years, that there are more homeless children 6 years of age and under than there are homeless single men, and that there are 360 homeless individuals in CB8, their community of origin before losing their homes. We pledge, personally and collectively, to work with pertinent stakeholders to create a strong, mutually supportive relationship between the residents of the facility and the surrounding communities, toward the goal of aiding these families’ return to permanent housing. We have read the promises issued by the Department of Homeless Services and Praxis that the facility at 5731 Broadway will provide dignified, clean, well-maintained, safe apartments and common areas to the 83 families in residence. We have also read that Praxis will “provide an array of on-site services and off-site service linkages to help these families stabilize their lives and ultimately return to independent living.” We intend to hold DHS and Praxis accountable not only for these promises, but for abiding by them at the highest possible level of care and professionalism that can be offered to the families residing at 5731 Broadway. We are deeply concerned, as residents of New York City, about the crises of affordable housing, poverty, income inequality, systemic racial and economic injustice, abusive policing, corruption in the private development and real estate sectors, and other corrosive realities that contribute to homelessness. We will continue to ask our elected and non-elected leaders: why does homelessness exist? What are you doing to provide all New Yorkers truly affordable, permanent housing and to prevent homelessness from occurring? Nearly 1.7 million New Yorkers lived below the poverty line between 2011 and 2015, numbers unseen since 1970. The Bronx leads the City, with over 52% of its neighborhoods in high or extreme poverty. More Bronx residents are facing homelessness and are rent-burdened than those of any other borough in the City. Thirty-six percent of Bronx families are food-insecure. Thirty-eight percent of South Bronx families live below the poverty line, making it the poorest Congressional district in the nation. The connections between these realities and homelessness are obvious. Gentrification is becoming rampant, people are facing unprecedented stress due to rising rents, and more and more luxury housing is being built in the South Bronx. Last, but very importantly — some people in the CB8 area and beyond have responded to the proposed 5731 Broadway facility with opposition underpinned by views that are biased, stereotyping, discriminatory, racist, hateful. We demand that you, our elected and unelected leaders and officials, publicly address these views, which are being expressed off- and on-line, and renounce them. Further, we ask that you undertake long-term efforts to educate your constituents that hate has no place in any community. We will continue to hold you accountable to these demands, at all times, and during this era when hateful and white supremacist views hold sway in the White House and elsewhere.